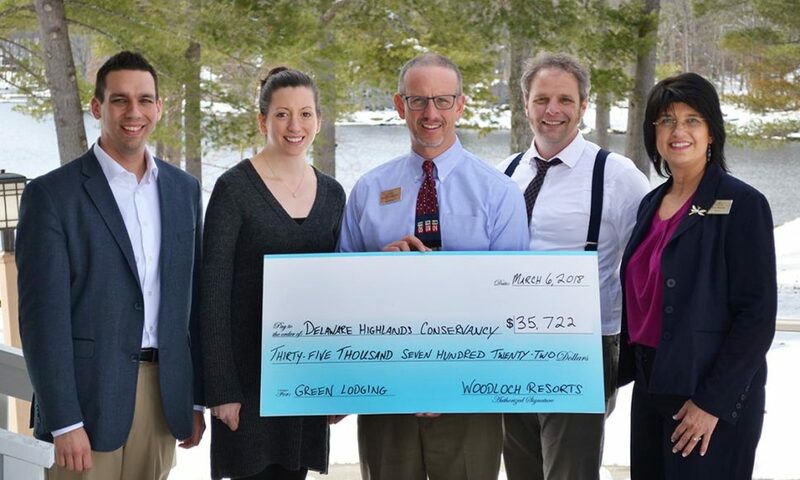 On March 6th, representatives from Woodloch Resorts presented the Delaware Highlands Conservancy with a check for $35,722 for funds collected in 2017 through the Green Lodging Partnership. The funds were collected at both Woodloch Pines Resort and The Lodge at Woodloch. Through the Green Lodging Partnership, guests at participating hotels are invited to make a $2-per-stay donation to the protection of the beautiful farms and forests, clean waters, and outdoor recreational opportunities that make the Upper Delaware River region such a wonderful place to live, work, and play. The funds raised directly support the Conservancy’s land protection efforts—and ensure that everything that’s special about our region will remain, now and for future generations. Photo, from left: Rory O’Fee, Woodloch Resort; Bethany Keene, Delaware Highlands Conservancy; Bob Kiesendahl, Woodloch Resort; Jason Zarnowski, Delaware Highlands Conservancy; and Tess Murray, Woodloch Resort.